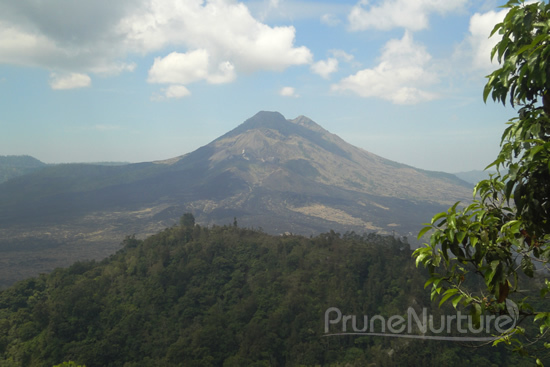 Kintamani is a highland area north of East Bali where the active volcano Mount Batur and Lake Batur are located. Usually tourists go for a day trip and unless you are planning to do mount trekking or the like in the wee hours then accommodation will be good. It can get chilly so it is better to have some warm wear. It took us about 2-hour drive from Lovina to Kintamini. 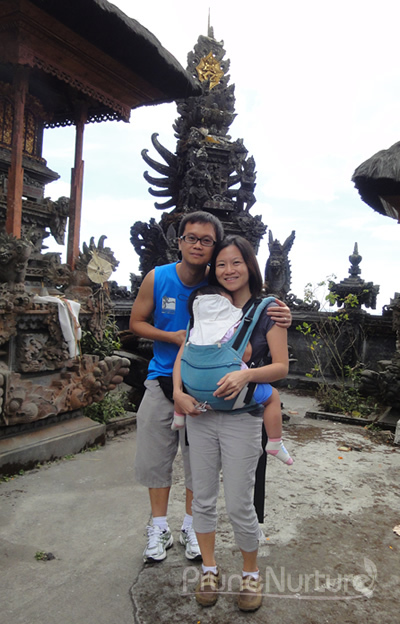 On route there, we stopover at Singaraja, the largest city in North Bali for a short while before heading off. As the car droved up the highland, we could see the clouds beside us and the air got a little chilly. 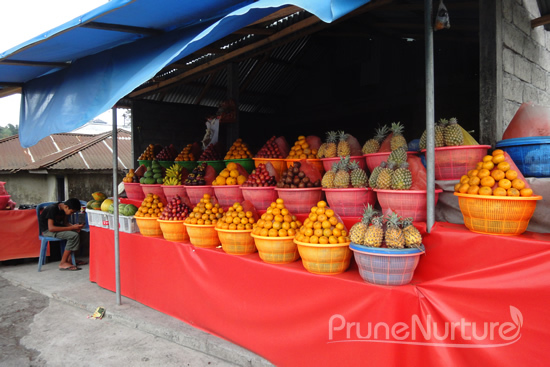 Along the way, we saw many stalls selling oranges and then realized that Kintamani also grows a lot of oranges. Before our lunch, our driver invited us to his family’s temple. He shared that Balinese families have their own temples and he even showed us his family tree in a frame hung up on the wall. That was definitely an eye-opener, an insight into their world! Our driver took this picture for us in his family temple. The first local household we visited and we were humbled by their warmth and hospitality. Our driver then brought us to his humble house to meet his wife who was then cutting the jackfruit. 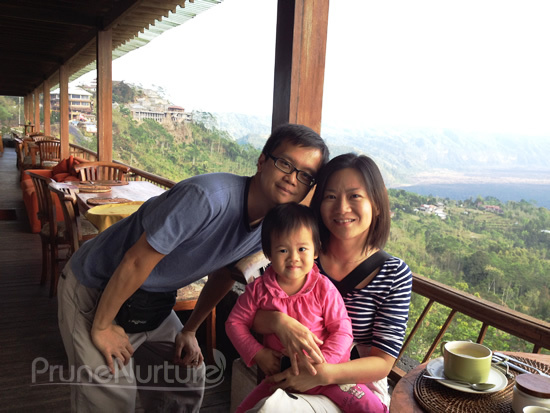 We then went to an Indonesian restaurant for buffet lunch, whose location gave us a beautiful view of Mount Batur. Before we checked-in to our hotel, we went to a coffee farm where we saw face-to-face the luwak or civet that produces the most expensive coffee in the world – Kopi Luwak. When we first stepped into the farm, the farm staff asked for our nationality, probably checking out their potential customers. She then introduced briefly the plants around her, the luwak and the process of making kopi luwak. She quickly ushered us to sample the different coffees and then to their shop which sells many different types of coffee including kopi luwak. As we were not expecting to visit this kind of farm that was trying to sell to us, we told the staff that we were not coffee drinkers and we were not keen to try or buy their coffee. We left the farm in less than 10 minutes. The lonely luwak for display at the coffee farm. 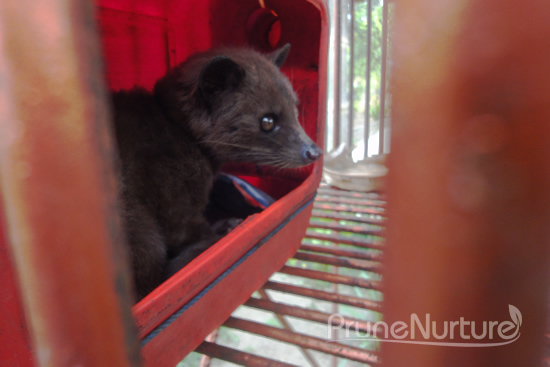 In order to cash in on the lucrative enterprise and make the production process less labor-intensive, some entrepreneurs have started caging civets and feeding them coffee beans. According to Umur, however, this process produces “non-organic” coffee of substantially inferior quality. Beware of fake kopi luwak or even blended kopi coffee which may only be 1% of the composition. 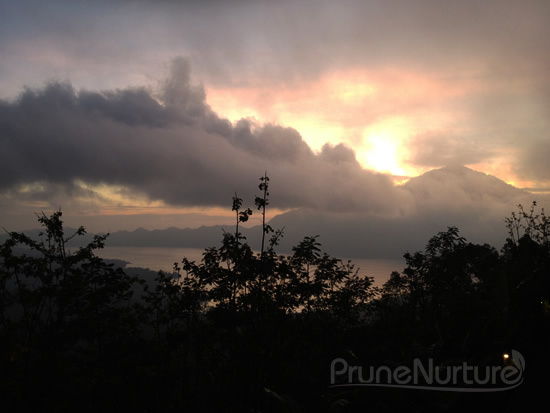 Read here on how to choose genuine kopi luwak. After this farm visit, we finally checked-in to Lakeview Hotel. We dropped our luggage and went out for a walk to check out whether there were any nice restaurant for our dinner. We did not find any suitable restaurant for that evening and had ours at Lakeview restaurant, Danu Lounge instead. After the dinner, we went back to our room to rest. I found myself waking up very early in the morning at around 6am probably due to my early rest the night before. I stood at the balcony of our room and was amazed by the beauty of God’s creation. I took my camera and shot several shots of the sunrise. We packed our luggage and bags before we headed for our breakfast. Before that we went to the reception to inform that we would like to check out early at 9.30am so that we could head straight to Mara River Safari Lodge. Dot had been bugging us to bring her to the safari park to see the animals and also other then the beautiful scenery before us, there were not much things we could do there. We had our breakfast at Danu lounge. After breakfast, we were all ready for our next destination, Mara River Safari Lodge, to live amidst the animals. Service quality: The front desk staff at the reception willingly helped us with our requests though some of them have difficulty understanding us. Deluxe room: When we first entered our room, we were rather pleased with the room layout and design. But after walking on the floor with our socks for a while, they became black. We were very disappointment and tried to make a call to the reception from our room but there was no number indicated on or near the phone to call. We have to make our way down to the reception which is about 5-10 minutes walk and told them to clean the floor in our room. A staff went to our room to clean but it was still not clean. Not sure whether the staff used a broom or a mop to clean our room because I saw two staff cleaning the floor along the corridor just using brooms. Since we were only staying for a night, we just bore with the dirty floor. The water heater needs about 10 minutes to warm up so we were told by the staff to just let the water flow until it is warm enough. Food: The food was not that great. Special request: We had our dinner at Lakeview since it was very cold and foggy outside. 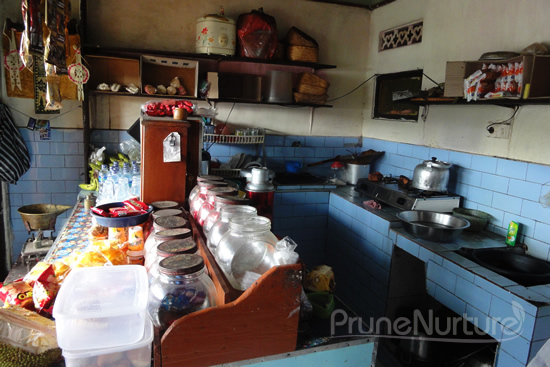 We requested the kitchen to cook porridge for Dot but the staff told us that they could not cook porridge. Disappointed. 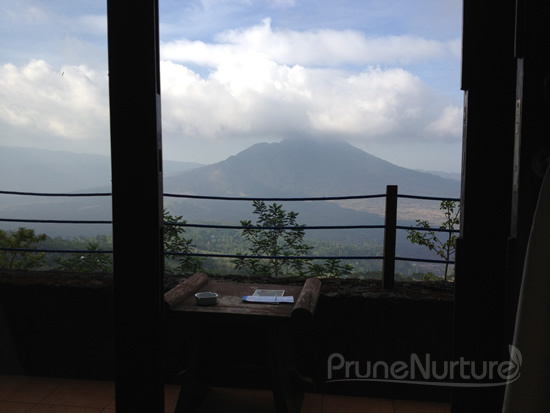 Ambience: The only reason why we chose to stay at Lakeview was to have a good view of Mount Batur and Lake Batur. Indeed, the view was stunning from our room and even from Danu Lounge.